Welcoming our new Artistic Director! We are excited to announce that local multidisciplinary artist CAROL KAJORINNE is our new ARTISTIC DIRECTOR! After working with CAHEP for a number of years as an arts educator, Carol will expand her role on our team to oversee the artistic growth of our community and school-based programs. Carol is an energetic and thoughtful collaborator with an abundance of community arts knowledge and skills that will be of great benefit to CAHEP. We can’t wait to see what unfolds under her creative leadership! I am ecstatic and honoured to deepen my relationship with the community organization during this time of growth through sharing my own spirit, connections and strength. CAHEP is a heart and community driven organization, and I am grateful for this opportunity to learn, stretch, share, and deepen my skills and knowledge through this important work. I look forward to working collaboratively with the community that surrounds CAHEP. Carol Kajorinne (HBFA) is an emerging, multidisciplinary artist living in NW Ontario on land that has been in her family for five generations. Located just north of Thunder Bay, over the past year Kajorinne was enthused to be the Public Programming Coordinator with the Thunder Bay Art Gallery and has been working as an arts educator since 2010. In 2012, she was awarded an Ontario Arts Council (OAC) Northern Arts grant for the “Preserving Harold Project,” which was part of a two-person exhibition “Preservation | Desire to Fill” at the Thunder Bay Art Gallery in 2015. Since 2012 Kajorinne has been an Assistant Program Coordinator with the Community Arts and Heritage Education Project and in 2015 was awarded an OAC Artists in Education grant for her “Clay Smithing” in-school projects. 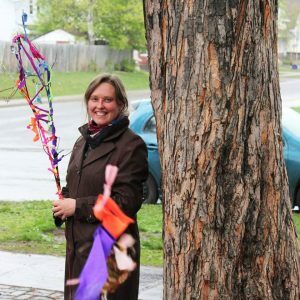 She is a founding member and Secretary of the local Thunder Giant Metalsmith Guild (2013) and is an active, founding member of Satellite Studio Artist Collective, which in 2014 received an OAC Visual Arts Project grant for “4 By 4,” and in 2015 designed the “Art Bus” for the City of Thunder Bay. In 2015, Kajorinne became an active core team member of Youth Social Infrastructure Collaborative, engaging people across the province in conversations that ignite social change and cultivate shared knowledge in effort to build a resilient and equitable youth sector. My heritage and the lands my ancestors and I have inhabited for five generations is a vital part of my experience, and greatly influence my artistic practice. In addition to heritage and preservation, I explore themes of life cycles and rebirth – how we are all comprised of the same elements and are vulnerable to the currents of change. My artworks are emotionally driven, comprising of various mediums including metal, found objects, photographs, and light. These mediums facilitate my exploration of life and family, its internal rhythm and connections. My physical involvement and methods selected are integral to my practice, and provide deeper meaning to my work. Light, for instance is a theme I once painted, which now is a medium I manipulate – as I use a torch or forge. The method of blacksmithing relates to themes of rebirth and connection, as all elements (water, air, earth, fire) are required when transforming steel. I began exploring themes surrounding ancestry, preservation, life cycles and rebirth through a documentary process in “Self Portrait as a Sauna Stove” (2010), and later in the “Preserving Harold Project” (funded by the OAC in 2012-13). I learn blacksmithing from Dave Hanson of Duluth (MN), through the local metalsmith guild I help found, as well as through attending conferences and workshops.